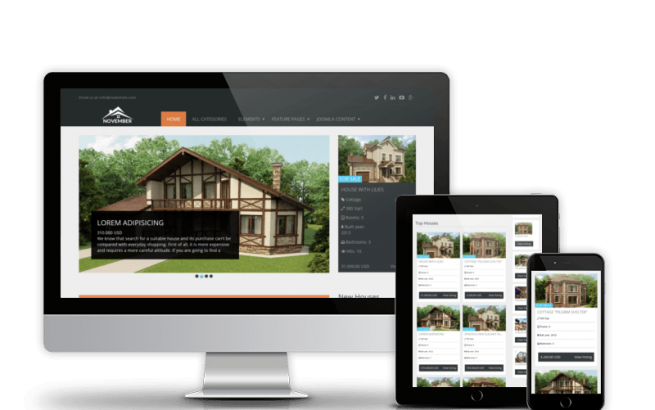 Real Estate November is a beautiful Joomla template built for design, interior agencies, home staging sites and businesses of the same kind. The home page of Real Estate template is divided into several blocks that make it easier for you to organize the content and make its look more structured. Awesome slider allows you to demonstrate your properties for clients, flexible search helps visitors find any property very quickly and real estate modules built in template is a nice solution for showing your villa, land, apartment, house. Thanks to a Module Touch Slider for Joomla real estate extension, Module Featured for real estate website builder, Module Search for real estate booking software, Real Estate Manager Google Location Map this real estate template ensures a dynamic look. Combined with a powerful marketing strategy, such a design will help you boost profit and engage more visitors in no time. Well written code, makes you comfortable to redesign the theme. Well documented help file helps you modify and edit this template according to your own wish. We provide not only template, but Joomla Quickstart package that includes template, Real Estate Manager Basic, sample data (for newcomers) and all modules.